How did London become ground zero for the global plutocracy? As long as the tide of foreign money sweeping into London is one of the factors pushing up property prices, there is relatively little appetite to change anything. At the end of the day, a very large number of people in the capital stand to benefit from London's growing reputation as the centre of the world for the global elite. Peter Apps is the executive director of PS21. He tweets: @pete_apps. The opening of Arthur Conan Doyle’s A Study in Scarlet finds Afghanistan veteran Dr John Watson pondering his future. Inevitably, he finds himself in London, “that great cesspool into which all the loungers and idlers of the Empire are irresistibly drawn”. The century that followed saw London lose much of its status as the centre of the world. In the last decade, however, it has really bounced back. The UK might be a fading power on the world stage, but its capital city is back at the top of any list of pre-eminent metropolises. London is a much cleaner city, both metaphorically and physically, than it was in 1887. There are no longer prepubescent chimney sweeps; there are no more choking smogs. Nor is then nearly as much criminality: the UK is a country that respects the rule of law and human rights, invariably placed at the right end of any league table measuring global corruption. But look more closely – peer, for example, behind the Victorian facades of Baker Street, where Sherlock Holmes would have lived. According to Global Witness, much of the street – including number 221, should you be wondering – is part of a £147m London property empire, whose ultimate ownership has proved remarkably difficult to establish. Documents seen by the transparency group suggest links between the management companies responsible for those properties and the Kazakh secret police chief Rakhat Aliyev. Aliyev was never convicted of any crime. But last February he was found hanged in an Austrian prison, where he was awaiting trial for the murder of two bankers in his own country. The management companies have categorically denied that Aliyev owned those properties – but they’ve refused to name the true owner, either. Last week, Global Witness argued that “there is an urgent need for the UK authorities to investigate who truly is the ultimate owner of this property empire”. This is a not unusual story: large chunks of central London are now owned by holding companies, whose ultimate owners may be difficult to pin down. In many cases, this is largely innocent: a desire for tax efficiency or privacy that is entirely legal. But just occasionally, it’s something more. And the rest of the world is starting to notice. London – and, for that matter, the global network of trading cities it gave birth to such as Dubai, Singapore and Hong Kong – promises both the rule of law and utter opacity. It’s just the right balance to appeal to dubious people with colossal quantities of money. According to Transparency International’s analysis of data from the Land Registry, 36,342 London properties are owned by what they call “offshore haven companies”. That means trusts or companies headquartered in places like the Channel Islands or British Virgin Islands. These can be remarkably effective in masking true ownership. Those properties, incidentally, cover 2.25 square miles of the city. How many of these properties were bought using money from questionable sources is remarkably difficult to prove, but the simple truth is this. Should you be the kind of person who suddenly finds they have a few million dollars in a country where someone might try to take it back from you, then London property is the safest place to hide your money. In principle, all kinds of rules exist to make sure the authorities can track the source of funds. In practice, though, such enquiries only ever go so far. Often, pointing to an overseas company or money from “consultancy” is enough. And why shouldn’t it be? Expecting estate agents and managers to become forensic investigators of the people who are giving them money – and do so at their own expense – is not entirely realistic. An entire industry has grown up around making banks and other institutions confident that they have fully complied with the requirements of the law. Buy a compliance officer more than a couple of drinks, however, and they often admit that their job is about proving that they have done “just enough” – and doing so, ideally, without scaring away the most lucrative customers. We have to be careful to avoid lazy stereotypes here. Not all of that money is dodgy. And, strictly speaking, bankers and real estate agents are expected to report to the authorities if they believe that clients are “politically exposed persons”, or PEPs: individuals looking to launder backhanders or other nefarious wealth. How well the system works is another question, however. In 2012, Coutts – bankers to the Queen, amongst others – were fined by the Financial Services Authority for “unacceptable” failures in checking on politically exposed clients. In several cases, the bank was found to have failed to identify criminal allegations or prosecutions. In others, warnings had been raised, but had gone ignored. Even where systems work, the well-connected can still work through third-party trusts, front companies and lawyers. Nor is it clear that the British government acts in all instances of tipoffs. Libya’s Muammar Qaddafi, after all, was able to move considerable quantities of money through the UK and Europe right up to the 2011 revolution that saw him forced from power. Earlier this year, Channel 4’s exposé documentary From Russia with Cash saw a reporter posing as a Russian government official finding it remarkably easy to navigate London’s property market largely unchallenged. What rich, powerful people really like about London is its rule of law. In Russia, entire companies can be appropriated by corrupt judges or other government officials. In Britain, though, whatever you buy is protected. In that sense, London’s reputation for probity actually enhances its appeal to those trying to store their now semi-legitimate spoils. Talk to someone who cares about corruption in Pakistan or Nigeria, however, and they tend view London rather differently: as the central focal point for much of the corruption in their own countries. In his 2011 book Treasure Islands, Nicholas Shaxson identifies another unique advantage the capital has: its position at the heart of a wider network of offshore trading centres with much looser rules. The Channel Islands, British Virgin Islands and others all offer a much lower degree of scrutiny, while still providing a degree of official protection. London also benefits from its long-term historical connections with the world’s other great financial trading centres. Many of them – Hong Kong, Shanghai, Dubai, Singapore – were themselves founded by London financiers. This network is the backbone for much of the legitimate trade on which the global economy depends. But it is also remarkably useful when it comes to facilitating corruption. There is another awkward truth to consider. No matter how many people the British government pays to try to clamp down on activities like tax evasion or corrupt financing, there are almost certainly going to be more and better paid people working to circumvent it. Some of them may be working only a couple of miles away on the other side of the city. And that, of course, is if the British government regarded tackling such activities as a priority at all. It doesn’t. Exactly how much of London’s real estate market is actually dodgy is hard to estimate. In July last year, estate agents Savill’s said that foreign buyers accounted for 32 percent of all sales in the capital. The majority of those, however, were people resident in London, buying a home to live in (37 per cent of Londoners, after all, were born overseas). In fact, according to the Savill’s numbers, only 7 per cent of transactions in London came from buyers actually resident overseas. But at the top end of the market, that number appears to be much, much higher. A survey by fellow estate agents Knight Frank found that, when it came to properties worth £1m or more, the proportion of non-resident foreign buyers was roughly a quarter. Anecdotal evidence suggests that, the more expensive the property, the more likely the buyer is to be from overseas. The very top of the market is dominated by Russian, Middle Eastern and, increasingly, Chinese buyers. Since 2004, according to Transparency International, UK property worth more than £180m has been brought under criminal investigation as the suspected proceeds of corruption. According to its analysis of data from the Metropolitan Police, in over 75 per cent of these cases, the owners used some form of offshore corporate secrecy such as a front company based in a tax haven. The price of the properties included on this list varied wildly, from £130,000 to £9m. But the average was £1.5m – and nearly half (48 per cent) were valued at over £1m. 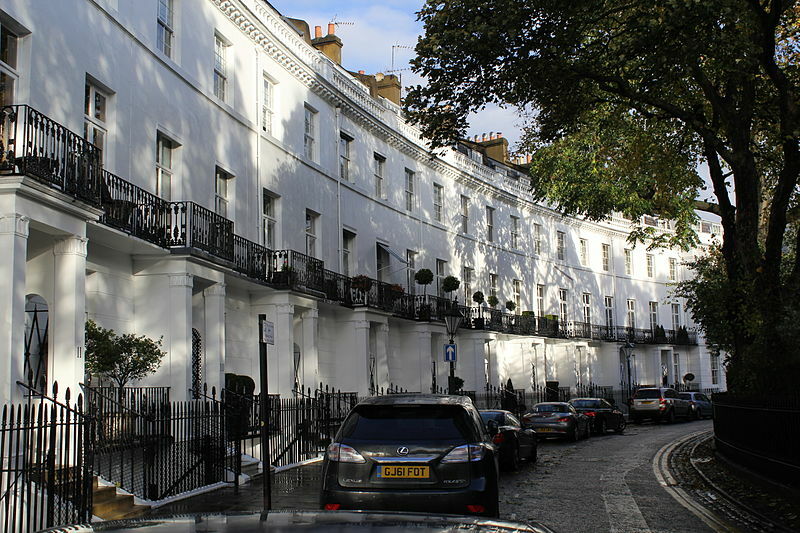 In all, Transparency International’s analysis of the Land Registry data showed, almost 10 per cent of properties in the City of Westminster were now owned by offshore haven companies; so are 7.3 per cent of those in neighbouring Kensington & Chelsea. Of these, 38 percent were registered in the British Virgin Islands, 16 per cent in Jersey, 9.5 per cent on the Isle of Man and 9 per cent in Guernsey. In 2011, £3.8bn worth of UK property was bought by companies based in British Virgin Islands alone. Property has always been the money laundering option of choice for a certain level of wealth. Just as drug dealers and brothel operators use bars, nail salons and car washes – all businesses which operate mainly in cash, and can therefore be used easily to justify revenue – much wealthier crooks have always bought property. And London isn’t the only place where corrupt real estate is a problem: for all the attention of the US has devoted to clamping down on terrorist funding over the last two decades, its own rules are scarcely tighter than Britain’s. Indeed, it is still possible to buy a property with cash in the US, with remarkably little proof of identity or the source of your funds. Loose corporate governance in some states – particularly Delaware – allows them to operate within the US system much as Caribbean and Channel Islands tax havens do within the British. Miami, in particular, has a reputation for being a hotbed of dubious real estate deals. Both countries have certain red lines. In the years since 9/11, they’ve made it remarkably difficult for militant groups to pass money through any part of the Western banking system. Until the nuclear deal with Iran earlier this month, they’d been remarkably successful at targeting the front companies to Tehran was using to access the global economy, too. Tackling high-level political corruption in other countries, however, has never received close to the same priority. In June 2014, Transparency International published 10 principles which they say UK money laundering rules should take into account in order to tackle corrupt capital. It’s striking both how little traction those demands have got – and how few calls for that kind of action there have been. London’s unmanageability is nothing new. The British government has always struggled to control the city’s commercial activities – indeed, the Corporation of London was the only part of the country not covered by the Domesday Book of William the Conqueror, and that was in 1086. Perhaps it isn’t surprising, either. As long as the tide of foreign money sweeping into London is one of the factors pushing up property prices, there is relatively little appetite to change anything. At the end of the day, a very large number of people in the capital stand to benefit from London’s growing reputation as the centre of the world for the global elite. As long as it remains one of the world’s pre-eminent cities, will probably also remain one of its biggest cesspools, too. This piece originally appeared on Citymetric on July 28, 2015. PS21 is a non-ideological, non-national, non-governmental organization. All views expressed are the author’s own.